You'll find here everything about electronic musical instruments! Product Images: click to view fullsize version. 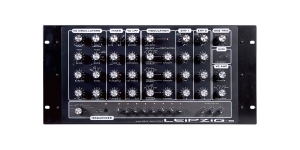 Leipzig-SK is a synthesizer with no memory integrated. There’s no parameter quantization – a tweak of a knob adjusts the actual analog circuit behavior directly. There is no proper CPU control over parameters which allows for achieving peculiar analog nuances. No presets mean no limits – you’re free to create each time you take Leipzig-S in your hands. The keyboard features 37 semi-weighted velocity sensitive keys, LCD helping with transpose, pitch bend and retrig. The connectivity offers 1/4″ CV inputs and outputs. 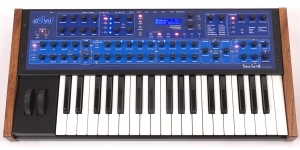 The SK version has the same structure Leipzig-S features but adds a MIDI keyboard. 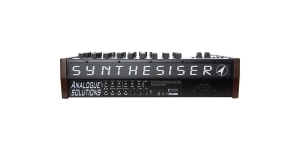 The synthesizer delivers 100% analogue voice and modulation circuitry representing a capable synth and drum synth. The Resonance control got improved. The architecture integrates a Moog style transistor ladder filter, two VCOs with glide feature and sub oscillator. Oscillator sync function and cross modulation are available. There are many drum possibilities as well as modulation routings. 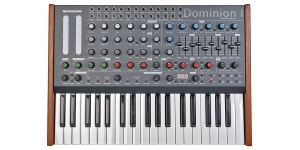 The analog step sequencer is featured onboard offering a number of clocking options. The connectivity includes audio in (the unit can be applied as a sound processor) and MIDI in. Please log in using the form below or register to be able to order goods and services. 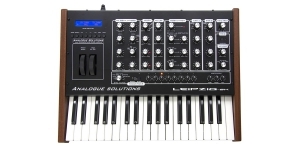 Synthesizer, Hybrid, Digital+Analog, Monophonic, Monotimbral, Oscillators' hard sync, Oscillators per voice: 4, Size: 3, Number of Keys: 37, Velocity Sensitivity, Aftertouch, Production start: 2006. Copying of information is allowed only with the direct link to the SYNTH.MARKET portal.